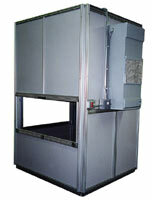 EAF enclosures can be supplied with a Modular Wiring System. EAF Modular T-Slotted aluminum profiles are designed and built from high strength 40mm x 40mm and 80mm x 40mm profiles. Wall and ceiling mounted air conditioners are available from 5,000 BTU and up. Filtered fans and exhaust grilles provide positive airflow. Select from a variety of 6mm thick PVC colored panel composites, which fit securely to our Modular T-Slotted Profile with vinyl gasket. Solid panels constructed from Trespa®, which is a product based upon Thermosetting resins, elastic properties, providing extremely high impact resistance. Brush seals for floor or access slots in panels. 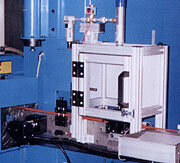 Acoustical noise control products for factory noise containment. A VCool System is designed to use filtered compressed air to cool industrial control cabinets without the use of any refrigerants. Hot air in the cabinet is vented to the surroundings through a built-in relief valve. EAF Modular aluminum enclosures are custom designed and built to meet your unique needs. We select from a complete line of modular T-Slotted aluminum profiles and components which make up every modular enclosure. 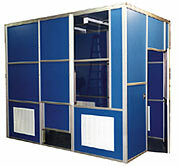 The modular panel design provides a unique and affordable solution for in-plant enclosures, offices, and partitions. We're a manufacturer that knows that our reputation is on the line with every enclosure project. That is why you'll receive the optimal aluminum enclosure based on price and quality.